The PMACA Lightweight 10/22 Takedown Chassis allows shooters to create the ultimate rimfire carbine. Like the author’s here with Slingshot Ti sound suppressor from SilencerShop. Ruger’s most prolific firearm also boasts one of the largest libraries of aftermarket components and accessories in the shooting world. From magazines, sights rails and furniture to muzzle devices and high-end carbon fiber barrels, the 10/22 can be anything a shooter wants it to be. One exception, is the 10/22 Takedown model. This version of the prolific rimfire carbine utilizes nearly all the same components, except one - furniture. Thankfully, several stock makers are adapting their designs to accommodate the newer takedown model. One in particular, has only recently begun to make their precision chassis for the takedown model. 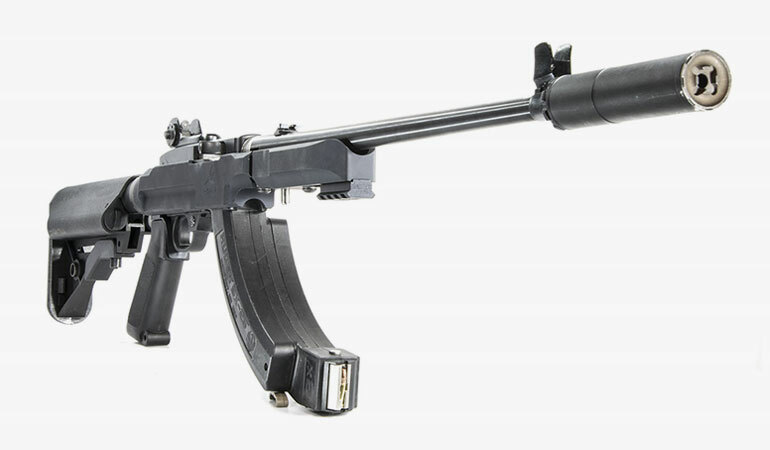 With it, a shooter unlocks a nearly inexhaustible supply of aftermarket stock options. Enter, the PMACA Manufacturing Lightweight Takedown Chassis. The PMACA Chassis transforms Ruger’s rimfire into a serious tool for survival and competition shooting. Milled from 6061-T6 billet aluminum, the 16-ounce chassis is as durable as it is versatile. The rear portion of the chassis features a standard threaded end for AR-15 receiver extensions. Below this, the PMACA Chassis includes a threaded portion designed to accept standard AR-15 pistol grips provided they lack a rear tang. 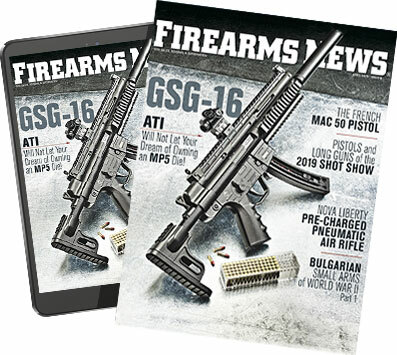 By doing so, a shooter’s 10/22 gains access to the enormous AR furniture market. This includes collapsible, folding and fixed precision stocks as well as dozens of pistol grips. For shooters over six feet in height, they can finally find a stock that extends far enough to fit them properly. More than that, because of chassis’ design, standard AR-15 stocks provide the perfect amount of comb height to achieve proper sight picture with magnified optics otherwise designed for AR-15s. This may seem minor, but a vast quantity of tactical optics are only designed for the comb height of an AR. So while the prospect of attaching a $1,500 Trijicon ACOG to a $200 rifle might seem ludicrous, mounting a $100 clone of one is not. While high-end optics may seem out of place on a budget plinker, mid-range high, quality glass like this Leupold work great with the PMACA and an AR-type stock. One small drawback of this, is that the comb height makes acquiring a sight picture with the stock sights virtually impossible. 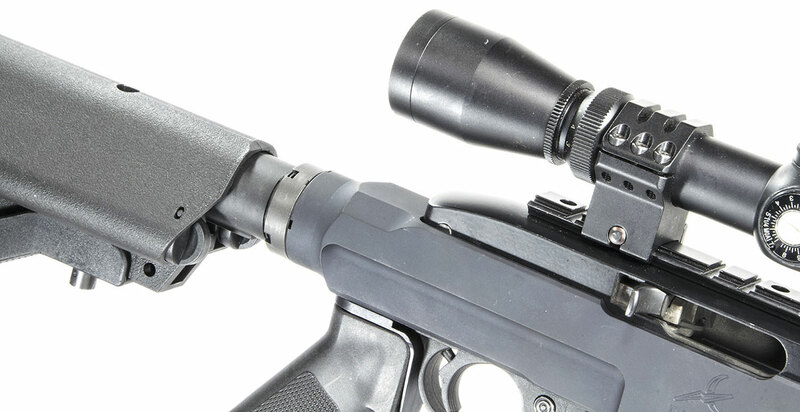 Though few shooters retain these sights once they equip their rimfire carbines with optics. Plus, the ability to utilize both the standard stocks and grips of an AR-15 make the 10/22 more comfortable for shooters with more experience on those platforms. That said, in testing the distance from grip to stock isn’t quite the same as on an AR. Consequently, some stocks might not be terribly comfortable when attached to the chassis. Not that they prevent proper sight picture, or make aiming awkward, but some interfere with the shooter’s ability to fully access the trigger - at least when fully collapsed. While somewhat archaic, Brownell’s Retro M16A1 pistol grip is a natural fit on the PMACA chassis. Likewise, as mentioned previously, pistol grips with tangs don’t fit due to the difference in size and proximity to the buffer extension. These can me easily modified to fit by simply trimming the tang, but just something for shooters to keep in mind. In my testing, the threading on the Chassis was flawless and totally in spec. All 10 stocks tested, fit and locked up perfectly. For those stocks that utilize the rear dimple in the receiver for alignment, the PMACA Chassis includes a small cadmium ring for tight lockup without an indexing point. One note of caution, whoever. Do not sand, trim or modify the cadmium ring! The material is extraordinarily toxic when ingested or inhaled. When solid, it is totally harmless to touch or tootherwise interact with. The ring functioned fine in testing and was invaluable given the designs’ lack of anti-rotation interfaces. 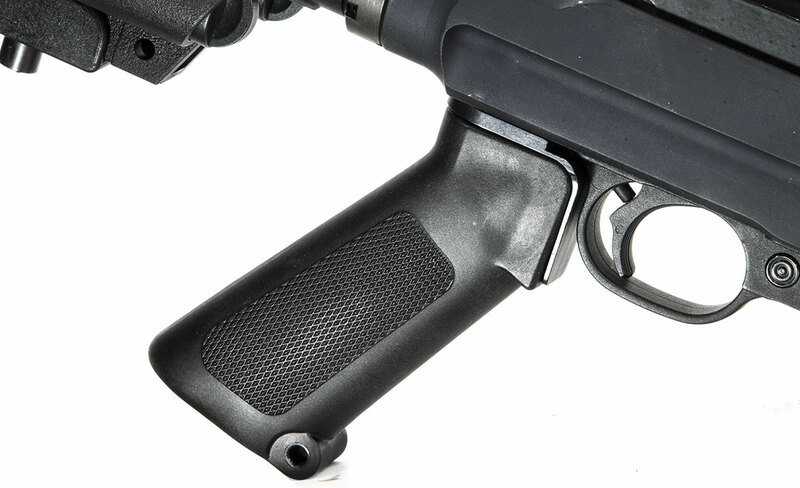 Speaking of interfacing, the stock attaches to the Ruger 10/22 takedown with two included screws. These are both shorter than the standard factory screws because the PMACA Chassis is much thinner than factory stocks. 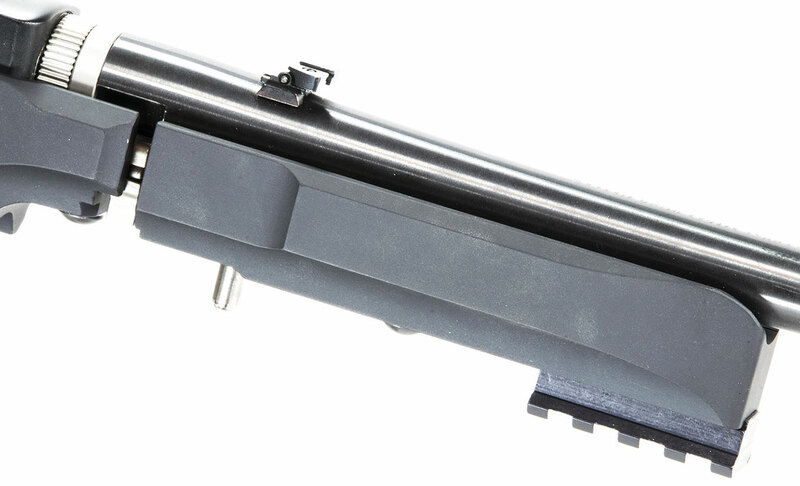 The forend of the PMACA chassis includes a small Picatinny rail segment for mounting lights, lasers foregrips or bipods. In testing, with just hand-tightening, these screws never came loose. While I was only able to fire roughly 350 through my Ruger with the chassis installed, it seems to hold up just as well as the factory furniture. What about the pistol grip interface? I was very surprised at how natural the grip angle feels with the Ruger. Given that the design was never intended for use with a pistol grip, the PMACA makes it feel very similar to holding an AR-15. So much so, I found myself reaching for the AR’s safety when running drills. 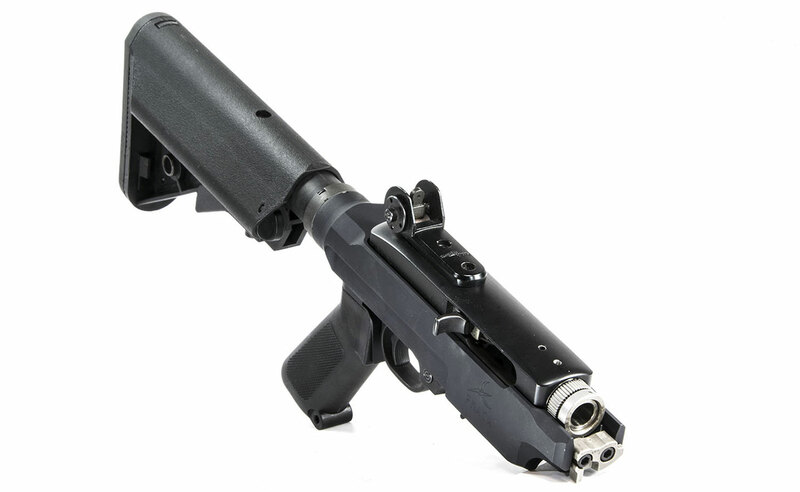 The PMAGA forend is minimalistic, but very effective. One area that the folks at PMACA might not have intended, but where the setup really shines is on a Ruger 10/22 Takedown Charger pistol. Provided the shooter utilized an AR-15 pistol brace, the PMACA would transform the Takedown Charger from fun range toy, to compact varmint gun. Coupled with a suppressor, the setup would be extraordinarily quite yet still compact and handy. Overall, with an MSRP of $144.50, the PMACA is more expensive than many furniture options, but also vastly more versatile. With the ability to utilize nearly all AR-15 stocks and most grips, a shooter can truly customize their 10/22 Takedown into a unique weapon tailored to them. The stock is available for sale directly from the manufacturer, at //www.pmacamfg.com.